I decided to do Tot School with Caterpillar (2) and Wild Thing (almost 4 and in preschool now) often joins in the fun, so I adapt the activities to work for both of them. We've been going with the "Letter of the Week" approach, but through the lens of exploring that letter through all five sense. We spent two weeks on C as grandma was visiting and quality time with her became a major priority, as it should. 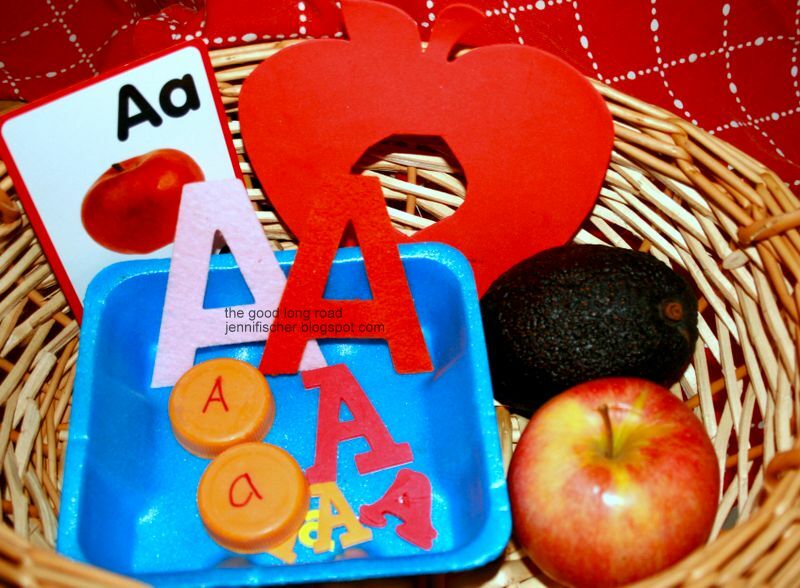 I'm excited to share 10 activities we did as we focused on learning about the letter C through the five senses and to be back next Tuesday with all we're doing with the Letter D this week. 1. Sound - We started off with things we could hear that began with the letter C and focused on two animals that the boys love to imitate -- cats and cows. I try to start each day with a new basket. For this basket, I included a farm book we have that features cows, some Cat in the Hat crayons (from the $1 spot at Target), various Letter C items, including a magnet letter and some milk caps with Letter C stickers, a crazy cow toy my mom gave us, a C is for Cat learning card and a Cat in the Hat book. We had lots of fun pretending to be cats and cows and reading the books. 2. 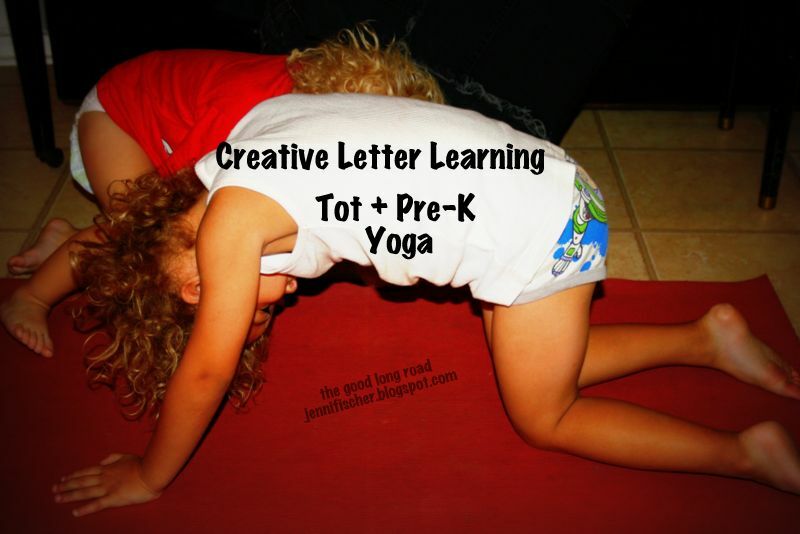 Learning Letters with Yoga - We also connected our Letter C learning with some Tot/PreK yoga time focusing on the cat and cow poses with the boys. Below, is the cat post in action -- arching their backs as best as they can. Having the crayons and the book together like this prompted a simple color sorting/matching exercise. As we went through the books, the boys would find items from the basket that were the same color as the current color pages we were reading. 4. Colors + Counting At Snack Time - I still had some colored fruit o's on hand from our Brown Bear, Brown Bear What Do You See? snack activity, plus a C notecard that corresponded with a color by number activity, so we put those items together with a recycled muffin container and had a perfect letter c snack activity -- sorting colors and counting. 5. Taste - For our official Letter C day focused on taste, I went with a much healthier option and again used Eating the Alphabet: Fruits and Vegetables from A-Z by Lois Ehlert. You can see a glimpse of the purple cabbage in this photo, but not the carrots really which were in the bottom of the glass container. The dip is a yogurt dip made with chives. Caterpillar tried the cabbage, cauliflower and cucumbers and seemed to prefer the cabbage. Wild Thing tried the cauliflower only and then stuck with the carrots. Obviously, the corn wasn't cooked yet, but the boys are both familiar with corn, especially popcorn! 6. 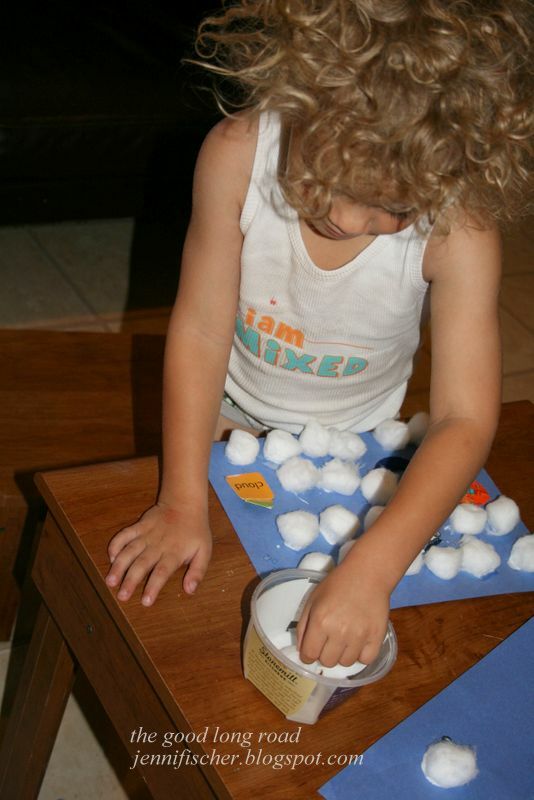 Touch - For a Letter C item the boys could feel, I put cotton balls and swabs into an egg carton. Initially, they explored the items on their own. Then, we did some cotton ball and cotton swab water color painting. 7. Smell - This is probably my favorite thing we did. I absolutely loved our Letter C "Scents-ory Bin," as I like to call it. My recycled muffin container came in handy again as we explored spices and coffee grounds (I used grounds from already made coffee). My mom gave the boys this book about smells, which paired well with the activity. I also added the word cards as the different items provided an opportunity to talk with Wild Thing about how the letter c makes different sounds in the case of cinnamon, cloves, chocolate and coffee. Depending on what the letter C paired with changed the way it sounded. I loved this extended learning opportunity for him. Oh - and here's a budget tip: look for cloves and cinnamon in the Mexican food aisle in bags rather than with the spices. I got them at a fraction of the cost this way. Both are now in our Fall Sensory Bin. The boys had a lot of fun with this one and played with it a few days in a row. 8. Cars Sensory Bin - Once all 5 senses were covered, we extended our letter C learning with some items the boys love. 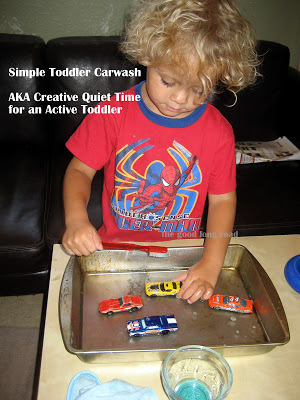 A Car Sensory Bin was just too obvious! As expected, it was a big hit too. You can't tell from the photo, but in addition to the cars books, cards, letter C items and Lightning McQueen, the basket also had several of their matchbox cars/hot wheels in it. A closer look at key items from our cars bin. 9. Early Writing Activities - We did some pre-writing activities too. I simply made a paper for both of the boys that had letter C stickers on it and some handwritten letters. First, we traced the letters with our fingers. Then, we pulled the cotton swab bin out again and watercolors and did some pre-writing work. Wild Thing eventually did tracing with markers too, but the finger tracing and cotton swab was perfect for Caterpillar -- challenging, but fun for him too. (In the photo, it's Wild Thing). 10. Wrap-Up Letter C Craft - Our final activity was a letter C craft that included several Letter C items from our week. Wild Thing enjoyed the activity quite a bit. Caterpillar enjoyed telling Wild Thing what to do and watching him do all the work! You can see the blue paper with one cotton ball on it, which is as far as Caterpillar got. We also have a few more photos from our Letter C week(s) on The Good Long Road Facebook Page's Tot School Photo Album. What fun learning activities are you doing right now? We'd love to know! Sharing at: Montessori Monday, Tuesday Tots, and 31 Days of ABCs - Letter C Linky. Those are great activities for the letter C. I love the 'follow your nose' activity with the spices and chocolate that start with C. Great ideas! Mmmm.....I bet those smelled fantastic! 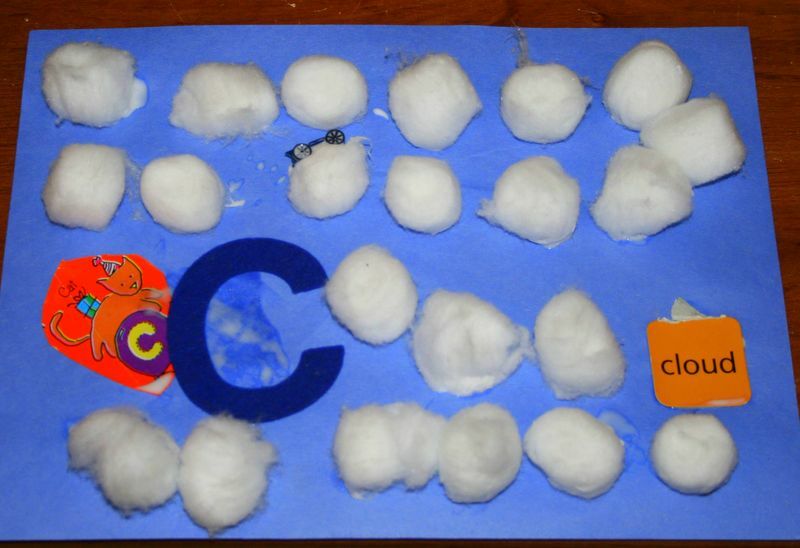 Jennifer I just love your letter c activities! Great idea to present through the senses and the kids seem totally engaged :) I am featuring this on the Kids Co-Op this week on Triple T Mum. Wow! So many great activities! And I love how you explored the letter C with all of your senses! 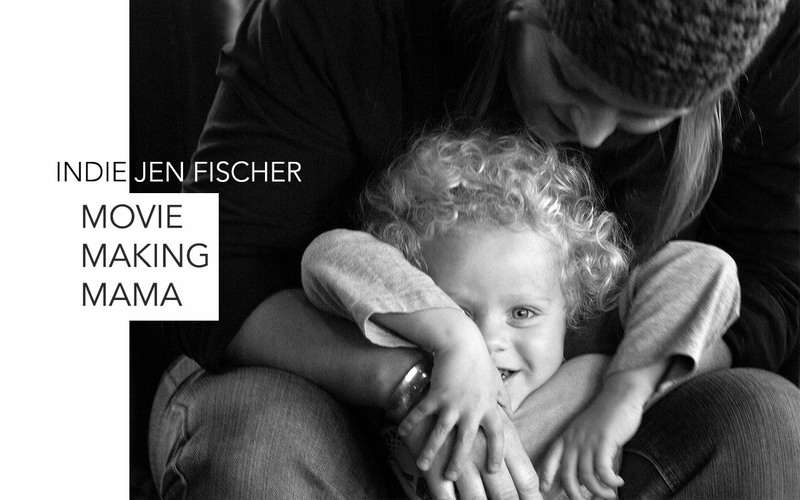 Thanks so much for sharing this in "31 Days of ABCs!"